The Blog – Page 84 – it takes balls to knit! Madam, I’m Adam. As well as possibly being the first words spoken by one person to another, the previous sentence is an example of a Palindrome. It reads the same forward and backwards. 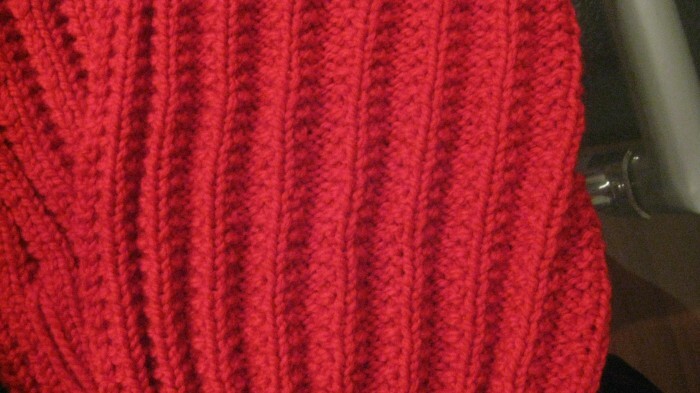 In knitting, its a reversible fabric. It can get really challenging when you’re doing it with cables, but very simple when you’re doing a rib. Most ribs are reversible, but they’re not exact palindromes as they’re not exactly the same on the reverse. A 2×2 rib is a true palindrome as it is the same on both sides. A 3×2 rib wouldn’t be however. It’s reversible, but would be a 2×3 rib on the reverse. 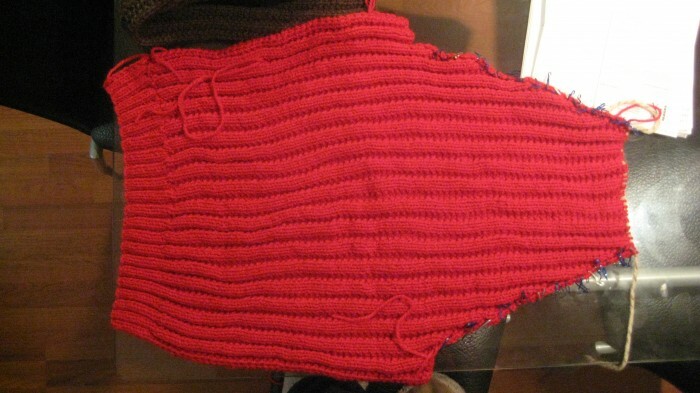 I have just finished a sweater for a friend of mine done in a very interesting rib I call Adam’s Rib. Most people know it as the Broken Rib but I don’t like this name at all. It’s a 4 stitch repeat pattern of the following: one row of stocking stitch, seed stitch, reverse stocking stitch, and seed stitch. I have seen the pattern instructions for it in two forms: 4 sts +1 and 4 sts +3. Both variations require an odd number of stitches but once you break it down and know what it is supposed to look like you can do it over any number of stitches of 4 or more. I decided I would do a sweater with raglan sleeves in this rib because I liked the way it looked. I had actually started such a sweater quite a few years ago but it had two rows of stocking stitch and as such wasn’t a true palindrome. Here’s a picture of the back of it. The detail picture shows the reverse of this rib which I actually liked better than the front. Later on I would find the pattern for the Broken (Adam’s) Rib which looked more like the reverse. This is not the reason why it’s in Area 51 though – I just didn’t like the way it was coming out so I stopped working on it. I’ll probably frog it and make a scarf sometime. Anybody want a bright red scarf ? 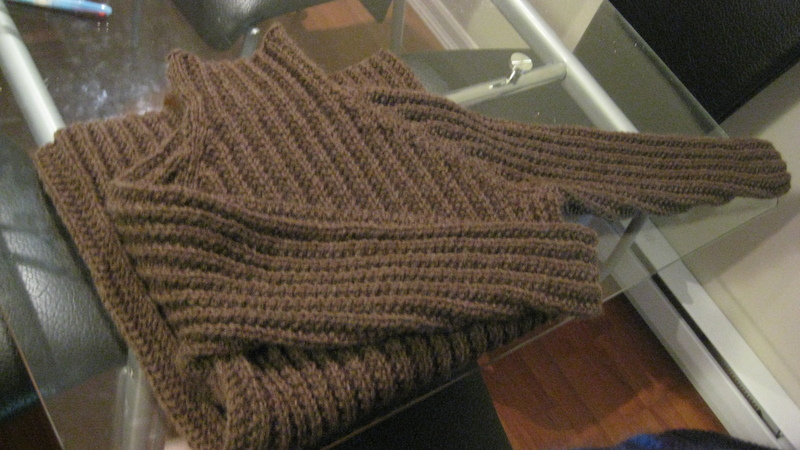 Anyway, I got my hands on a really nice chunky wool yarn the other day in a milk chocolate brown. I did a swatch in the Adam’s Rib pattern, made my necessary calculations, and started knitting. This sweater turned out to be a learning experience. I knit it up quite quickly while I was working on set (I work as an extra sometimes in the movies) and even managed to make a pair of mittens for a girl who was smitten by the color of the wool. As it turned out though, I made a slight miscalculation on my swatch. Since it is a rib, the swatch gathered in. I stretched it to what I thought looked good and took my measurements from that. The problem is that a 4×4 swatch stretches differently from a 18×23 swatch. Needless to say, the finished product was a little small for me – okay, a lot small. This is where Mike comes in. I instantly thought of him because he was the right build for it, and also this color was perfect for him. So he now has a brown Adam’s Rib sweater and I will endeavor to make another for myself. I did his from the bottom up but I will do mine from the top down in three colors. I plan to have it finished next week sometime and will put the pattern on Ravelry. You can find me on there under mrhugzzz. A slip as in slip knot is the best way to get things started. Sometimes, when you first meet someone and you need a conversation starter, there’s a slip of the tongue as you fumble for the right thing to say. That leads to you laughing at yourself and putting the other person at ease. A slipped stitch, when done intentionally is not a mistake and can create a beautiful design in a piece of work. In life, sometimes its a good thing to make an intentional mistake show how fallible you are. 2. If at first you don’t succeed, just frog it … there’s nothing wrong with starting over. Whether that means going back a few stitches, a few rows, or the whole darn thing. Starting over can give you a new perspective not only on your knitting project, but whatever challenge you have in front of you. That is if you were paying attention and have learned from the mistake that caused you to frog it in the first place. 3. Variety is the spice of life … knitting with the same yarn, same color, or same needles all the time gets very boring – quickly! Just like in knitting, changing what you’re working with (or who) creates endless possibilities in endless variations. Push that bubble and see what you can create – take a plunge and say hello to somebody new. 4. Everybody needs to make sure they get enough fiber! I think this one is self explanatory and even more so for knitters. 5. A good foundation is the key … if your cast on edge isn’t good, well your stitches may just unravel on you. In life this is true in almost anything. Relationships, careers, personal health, you name it. If you make sure the foundation is strong, the rest will thrive. 6. One stitch at a time gets the job done … it would be great if we could cast on our stitches and then just magically knit all the stitches we need at the same time. Well, I’m sure you know by now that’s not how it works in life either. There’s nothing wrong with doing it one stitch at a time – its therapeutic and it allows you time to enjoy the process and the journey. Same in life. When was the last time you took the time to enjoy a really good meal – I mean chewing every bite and enjoying the euphoria of flavors in your mouth? Or took the time to enjoy a good walk? Or a good read? Or a good kiss? Think about it and try and slow down … you’ll still get there, but you’ll have more memories when you arrive! 7. With just two stitches, you have a world of possibilities or It takes two to make a thing go right … Isn’t it amazing what you can create with just a knit stitch and purl stitch? Isn’t it amazing what a computer can do with just a “1” and a “0”. Isn’t it amazing what two people can create together? Sometimes, the only thing you need to get the job done is one other person. 8. Size matters … If anybody tells you differently, they’re lying! If size didn’t matter, all needles would be the same size, yarn would be the same thickness, and we wouldn’t have to make another tension swatch – EVER! I’ll leave you to ponder the implications here. 9. It takes balls to knit … this should probably be first since its also my blog title, but as things would have it, its listed ninth. No biggie. It really does take balls to knit, as with anything else in life that you decide to do. I mean, think about it. Its easiest to just stay in bed and do nothing. But if you want to actually accomplish anything in life, you actually have to take a chance and try it. 10. Stereotyping is passe … If you told me 15 years ago I would be blogging about knitting I would have told you you were crazy. If you’d told me that the best golfer in the world would be black or one of the most popular rappers would be white I’d have laughed at you. If you’d told me any of a number of things where stereotyping was the norm … well you get the idea. Its a new decade and time we woke up and smelled the coffee. Anybody can do anything. They just have to have the balls to actually go out and do it! Somewhere in southern Nevada there is a highly secret military base known to many as Area 51. It is rumored to have many highly classified military secrets including proof of the existence of UFOs. The airspace around Area 51 is also highly restricted and is known as The Box. Well, it is a well known fact that all knitters have an Area 51 which they call The Stash! It holds many secrets including the proof of UFOs as well. Except that to a knitter, a UFO is an UnFinished Object. It is rumored that you are not a true knitter unless you have at least 3 UFOs in your stash. Of course, everybody’s stash is different in size and the number of UFOs vary. Personally, I stopped counting my UFOs at 10. I mean, we all know they exist, right? So why bother trying to deny it? For me they’re an oddity that shows an interest in a particular facet of knitting at a particular time in my knitting development. At some point some of them will get completed while others will just sit there amidst all the others. You might ask why would someone have a UFO in their stash to begin with. I mean isn’t the reason to start something so that it can be finished? Well, not necessarily. For me (and I can only speak for myself), I start things for a variety of reasons. When I peruse the various knitting magazines that come out monthly, there is quite often something that catches my eye. Being a male however, that something is usually made for a female. Since I truly enjoy the process of knitting, I will start to make it anyway. I gain knowledge and insight and usually experience in making a new texture. Once I have done enough of it to get the feel for it, I decide whether or not I am going to finish it. If I happen to know someone who would fit the particular item I am working on and whom it would fit, I usually finish it. If not, it becomes a UFO until such a person appears. I will keep you updated as to the progress of this. Another reason I have UFOs is boredom – well, maybe not boredom, more like complacency. I love challenges and usually tackle projects that require a bit of concentration. At least, they do in the beginning. Once I get the pattern in my head though, it becomes a bit repetitious for me. So I start a new one. And another. 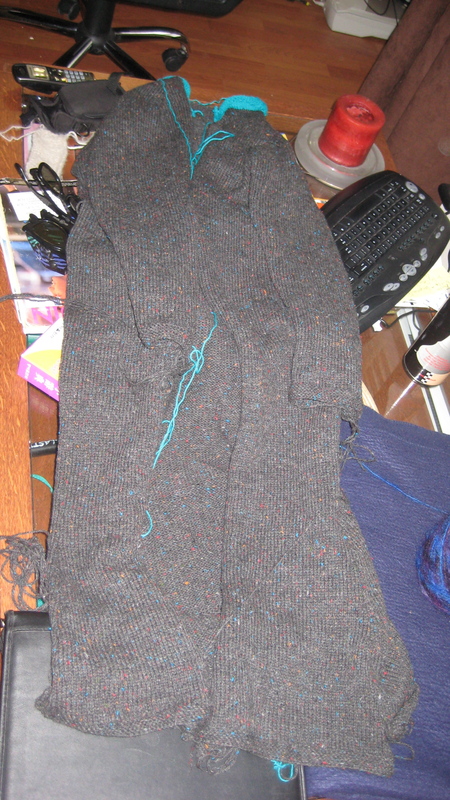 right now I am in the process of knitting 5 sweaters that I am designing. I switch back and forth regularly to keep it interesting. It keeps my Area 51 interesting as well. And while my Area 51 is quite large, The Box isn’t. You are welcome to come by anytime and I will show it to you … I love to share. Unlike the military … perhaps that’s why there really aren’t any UFOs in their Area 51. Or is there? To try and think of a perfect beginning to this blog is too difficult a task as the topic is too varied. There are almost as many facets of knitting as there are knitters! I am one such knitter who discovered quite a while ago that I have a passion and a bit of a knack for the art of knitting. Where did it start? Well, for as long as I can remember I have always loved sweaters. One day in ’93, I saw one in a window that was just saying “BUY ME”, kinda like the pills that Alice saw on her adventure in Wonderland. Much to my dismay when I went into the store however, the price tag was a lofty $500! I walked away dejected and sullen, accepting the fact that I would never own that sweater. A few days later, since I couldn’t get the sweater out of my mind, I decided that it was worth $500 and went to put a deposit on it to purchase it through a lay-away plan. Unfortunately when I arrived at the store it was no longer n the window or even in the store itself. Apparently someone else had thought it was worth the outlay of cash and had had the funds to buy it. I decided right then and there that I would learn to knit so that I could design and make my own sweaters. I would be able to choose the fiber, the color, the style, … everything! Well, I am please to say that within a year I had made several sweaters and scarves. It was more through perseverance and dog-eared determination than anything else. I was slow and in the beginning, sloppy. I didn’t care. I had finished a sweater. Since then I have learned a lot about knitting – enough to know that the learning never stops. I can now design and knit a sweater (or any garment for that matter) for myself or anyone else. Join our Close Knit Community and get a FREE pattern! We'll also help you grow and develop your skills while exposing you to special member savings, patterns and giveaways! We never spam and never, ever, sell your information! We look forward to seeing you as part of our global commuKNITTY!